And there is something to be said about the needle and thread I hold now in my right hand, as I clutch a little blue and gray sock monkey we found in the back of Owen's closet yesterday as I was doing some New Year's cleaning. He asked to bring it into his crib to join the menagerie of dolls and stuffed animals that have nearly overtaken the space where his little body goes to rest, and I said it was fine, only stopping him when I happened to glance over and saw some stuffing emerging from the little monkey's right leg. I assured my boy that I would fix the monkey's "boo boo" and return him right after Owen's nap. Something so simple -- a needle, some thread -- can fix so much. It's something so maternal, so natural, to want to mend, to care for, to fix as a parent. It is something that I can easily do for this silly monkey, and yet feel as though I am constantly failing my son in that same respect. 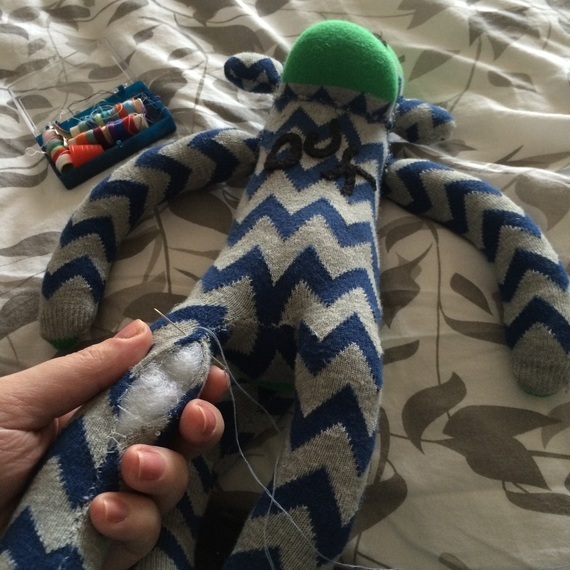 Where is the beautiful simplicity of the needle and thread to fix him? He is not broken in the sense that I would return him, or want another version that needed less repair -- but there are so many parts of him that need to be worked on, that need to be mended, that are misunderstood or baffle the broad community of specialists and therapists and doctors we have built up around him like a fortress. And still, there he stands, as though in some sort of bubble that we cannot break, cannot pierce, in order to understand him, to save him from himself and others who don't understand him and -- who don't, or one day won't -- care enough to try before rejecting him. Oh God, that's so horrible to say, but it's true. Sometimes, it's just true. And I'm not supposed to feel that way because I have a special needs child. It would be OK if he were typical, and screaming his head off in the lighting section of Target. It would be funny or relatable to complain or tweet or post a picture somewhere of my tantruming almost-4-year-old. I would have other moms shaking their heads because they can relate, they've been there. There would be reassuring comments on Facebook or Instagram, and funny little vignettes via text from friends regaling the times something similar had happened to them. But not if he has special needs. There are different rules. We can't blow off steam in the same public way. We need to hide the sadness, the frustration, the disappointment -- or risk being perceived as rejecting our children, as ungrateful for them, or even hateful towards them. Even if it is exactly the opposite of all of these things. I'm supposed to say he has the autism "superpower," or the "magical" brain malformation gene where he has the ability to make part of his brain disappear from the MRI images right before your eyes (only to have other parts magically appear all at once -- also called a stroke. Or would that be an "enchanted" stroke?). I am not that mother -- I don't buy into this being a superpower, or magical gene. Nothing about this feels otherworldly. Unbelievable, maybe. Dream-like? Occasionally -- but not in a good way. There have been no unicorn spottings here, not a single sighting of a leprechaun -- we don't even have a box of Lucky Charms in the house (partially because food coloring "magically" turns both of our kids into maniacs). I dearly wish I could be -- that I had that cheerful outlook and optimism that I see and hear about and read about from so many other mothers in my situation. Do I wish that he didn't have this myriad of diagnoses? Yep. But I have not found that thread yet. I have not seen evidence that it exists alongside these "superpowers" and this magic that we have supposedly been "lucky" enough to inherit along with Owen's genetic soup. This post originally appeared on Jamie's blog, Our Stroke of Luck. You can also follow Jamie on Twitter, Facebook, and Instagram.